A selection of Frequently Asked Questions for patients who may be suffering from an Abdominal Aortic Aneurism (AAA). 1. What is the aorta? The aorta is the largest artery (blood vessel) in the body. It carries blood from the heart and runs down through the chest and the abdomen (belly). Many arteries come off the aorta to supply blood to all parts of the body. At about the level of the belly button the aorta divides into two iliac arteries, one going to each leg. 2 . What is an Abdominal Aortic Aneurysm (AAA)? An aneurysm occurs when the wall of a blood vessel weakens and balloons out. In the aorta this ballooning makes the wall weaker and more likely to burst. Aneurysms can occur in any artery, but most commonly occur in the section of the aorta that passes through the abdomen. These are known as abdominal aortic aneurysms (AAA). Because the vessel wall is dilated and weakened an aneurysm can burst (or rupture). This is a very serious problem. The aim of any treatment is to reduce the risk of the aneurysm bursting. 3. What causes an AAA? The exact reason why an aneurysm forms in the aorta is not clear in most cases. Aneurysms can affect men or women of any age. However, they are most common in men, people with high blood pressure (hypertension), smokers and those over the age of 65. The wall of the aorta normally has layers of supporting tissues. As people age, they may lose some of this tissue. This is thought to explain why aneurysms are more common in older people. Your genetic make-up plays a role as you have a higher chance of developing an AAA if one of your immediate relatives (parent, brother or sister) has or had one. Other risk factors that increase the chance of getting an aneurysm include: smoking, high blood pressure, high cholesterol, emphysema and obesity. It is estimated that about four in 100 men over the age of 65 will develop an abdominal aortic aneurysm, though not all will be of significant size, and about one in 100 will have a large aneurysm requiring surgery. AAAs are about six times rarer in women than in men. 4. How are aneurysms discovered? The NHS AAA Screening Programme (called WAAASP in Wales) screens men aged 65 and over for AAA. Screening is performed using an ultrasound scan of the abdomen. This is a quick and painless test and is similar to the scans done on pregnant women to show a picture of their baby. The scan shows if there is an aneurysm present and how large it is. Men are invited for screening during the year they turn 65. Men over 65 who have not previously been screened can contact their local screening centre direct to organise a scan. After screening, if you do not have an AAA you do not need to have any further scans. If you have a small AAA you will be invited for further ultrasound scans. If you have a large aneurysm you will be referred to a vascular surgeon. 5. What are the symptoms of an AAA? 6. Do I need an operation to treat my aneurysm? Research has shown that for people with AAA measuring less than 55mm in diameter it is safer not to operate because the risks of having an operation are greater than the risk of the aneurysm bursting. Occasionally there are exceptions to this rule and an explanation will be given if these exceptions apply to you. Endovascular Aneurysm Repair (EVAR) Surgery: this is a form of keyhole surgery using a stent graft. If aneurysms are successfully repaired, this significantly reduces the risk of them bursting and there is a high likelihood that you will return to a normal life. Full recovery takes between three and six months after open surgery and four to six weeks after endovascular repair. The speed of recovery will also be affected by your age and general fitness. 7. 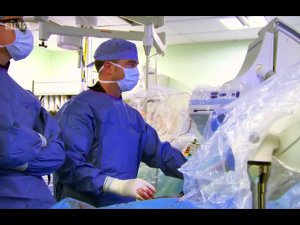 What is endovascular aneurysm repair? Endovascular aneurysm repair (EVAR) involves inserting a graft into the aneurysm through small incisions at the top of the leg and using X-rays to guide the graft into place. This can be done under local or general anaesthetic. The advantage of this type of repair is that there is no abdominal surgery. This technique is therefore statistically safer than the open operation, and you need to spend less time in hospital. A disadvantage is that some patients have to undergo a further operation or intervention at a later stage to refine the initial procedure. Following EVAR you will also have regular ultrasound scans over the long term to make sure that there are no problems. Not every patient or every aneurysm is suitable for EVAR. In particular, aneurysms arising close to or above the kidneys are more difficult to treat in this way. Under these circumstances the options might be open surgical repair, fenestrated endovascular aneurysm repair (FEVAR, see separate information sheet) or continued non-intervention. You will be assessed with a CT scan to decide if your AAA can be treated by endovascular repair. If suitable you will be offered a choice of type of repair by your surgeon. 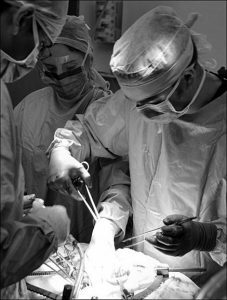 The risk of a major complication is lower for endovascular repair than for open repair. However, the graft attachment is not as secure as in the open operation. As a result, you will need follow up with scans to ensure that the graft has not slipped. It is estimated that about 1 in 10 patients may need a further intervention or operation on their graft after EVAR. As with any complex operation, general complications can occur, including infection in the wound, chest infections or diarrhoea. Deep Venous Thrombosis (DVT) is a recognised risk and most patients will have treatment during their stay in hospital to prevent this. If you do develop a DVT, then you may require extra treatment for this and this may prolong your stay in hospital. Infection in the graft used to replace your aorta. Less than 1 in 10 men may have difficulty sustaining an erection following surgery due to injury to nerves which lie on the front of the aorta. It is also recognized to occur following endovascular repair. If you have problems with this, please tell your doctor, as there are treatments that may help. If your risk of a major complication may be higher than average, usually because you already have a serious medical problem, your surgeon will discuss this with you. It is important to remember that your surgeon will only recommend treatment for your aneurysm if he or she believes that the risk of the aneurysm bursting is higher than the threat posed by the operation. After uncomplicated endovascular repair, most patients return to the hospital ward. The majority of patients will be able to leave hospital on the first or second day after surgery. You should be able to eat and drink normally once fully awake following your aneurysm repair. The nurses will aim to get you sitting up and walking as soon as possible. Once you are up and about, you should be able to leave hospital, but may need painkilling tablets for up to a week. Discussions with patients who have undergone endovascular repair suggest that it can be normal to make a full recovery in about two to four weeks, however some people take longer and can tire and take several months to return to the state of health they were in before the operation. During this time, you should gradually build up your level of activity back to normal. You may resume normal sexual relations as soon as you as you feel comfortable. Most people who are treated with endovascular repair can return to work within a month after having surgery. If you drive for a living, please read the section on driving toward the end of this information page. 8. What is open repair? You will usually spend 1-2 days in the Intensive Care or High Dependency Unit after your operation so that your progress can be closely monitored. It may be necessary for you to remain on a breathing machine for a short period after the operation but you will be taken off this as soon as possible. Following this sort of surgery, the bowel stops working for a while and you will be given all the fluids you require in a drip until your bowel can cope with fluids by mouth. It may be necessary for you to have a blood transfusion. Your own blood lost during the operation will be recycled and given back to you. The nurses and doctors will try and keep you free of pain by giving painkillers via the epidural tube in your back, or by a machine that you are able to control yourself by pressing a button. Over the next few days, as you start to recover, the various tubes will be removed and you will return to the normal ward until you are fit enough to go home (usually 8-10 days after the operation). You will be given a small injection every day to lower your chance of getting a deep vein thrombosis (DVT) or pulmonary embolus (PE) after the operation. These will continue until you are fully mobile and discharged from hospital. In the longer term after open aneurysm repair you can develop problems with incisional hernias or bowel obstruction from intra abdominal adhesions. Each of these individual complications is rare, but overall it does mean that some patients may not survive their operation or the immediate post-operative period. For most patients there is a small (less than 5%) risk of developing complications that cause death after an open aneurysm repair – in other words, more than 95 in every 100 patients will survive the operation. The doctors and nurses will try to prevent these complications and to deal with them rapidly if they occur. After any large operation there is a risk of DVT or PE. These are blood clots (or thrombosis) in the deep veins of the leg (DVT) that can rarely travel to the lungs. If a blood clot breaks off and travels to the lungs it is called a pulmonary embolus (PE). You will be on medication to reduce the risk of DVT and PE, but this cannot be completely removed. If you do get a DVT or PE you will require a period of tablets (Warfarin) to thin the blood for three to six months. DVT can lead to pain and swelling in the leg which may go on for a long time. PE can cause chest pain, can make you very unwell and is sometimes fatal. These can occur following this type of surgery, particularly in smokers, and may require treatment with antibiotics and physiotherapy. Wounds sometimes become infected and this may need treatment with antibiotics. Serious infections are rare. Occasionally, the incision may need to be cleaned out under anaesthetic. Very rarely (about 1 in 500), the Dacron graft may become infected. This is a serious complication, and usually treatment involves removal of the graft. Occasionally the wound in your groin can fill with a fluid called lymph that may leak between the stitches. This usually settles down with time. This may occur in men and women, due to nerves in your tummy being unavoidably cut during the operation. This occurs in about 10% of patients of men. E.g. incisional hernia, adhesional obstruction, para anastomotic pseudoaneurysm. If your stitches or clips are the type that need removing, this may be done whilst you are still in hospital. If not, it will be arranged for your GP’s practice or district nurse to remove them and check your wound. You will feel tired for many weeks after the operation but this will improve as time goes by. Lifting: You should avoid heavy lifting or straining for six weeks after the operation. 9. Why do I need to have my aneurysm checked regularly? The chance of rupture is very low for small AAA. For aneurysms measuring less than 55mm in diameter the risk of rupture is less than one in 100 per year (See reference 1 below). As aneurysms get larger than 55mm, the risk of rupture increases and it is usually at this size that the option of surgery is considered. For any given size, rupture risk is increased in smokers, those with high blood pressure, and those with a family history of an AAA. If a small AAA causes symptoms or grows quickly, your vascular surgeon may suggest that it is treated even if it still measures less than 55mm in diameter. 10. What do I do if I get new symptoms? If you experience sudden onset of new severe abdominal pain or back pain that is distinct from any back pain you may have had previously, you may be developing a leak from your AAA or it may be at immediate risk of rupture. 11. What can I do to help myself? If you have been told you have an aneurysm, there is no need to limit your everyday activity. Moving around, lifting and exercise will not affect your aneurysm or cause damage. Gentle exercise such as walking and cycling are recommended to help to improve your overall level of fitness. If you are a smoker the single most important thing you can do to help yourself is to give up smoking (see Reference 2 below). Continuing to smoke will increase the risk of your aneurysm growing. Stopping smoking will also help to protect all of your arteries, making it less likely that you will suffer from heart attacks or strokes. Giving up is not easy but there is a smoking cessation service and support groups that can help. Your vascular specialist nurse or GP practice nurse can advise you about these. High blood pressure is a known risk factor for rupture of aneurysms. It is very important that you have your blood pressure checked regularly, at least every six months (see references 3 and 4 below). If you have been prescribed medication for high blood pressure, you must make sure that you take it according to the instructions given. If you have diabetes it is important that your blood sugar levels are well controlled. You should eat a healthy balanced diet and try to reduce any excess weight. It is important to reduce the level of cholesterol in your blood: you will be given advice on how to do this. Your GP or nurse can refer you to a dietitian if needed. You may be prescribed a statin drug to lower your cholesterol level and low-dose aspirin to help prevent blood clots from forming. If you have a small AAA (<55mm) you are allowed to continue to drive. The DVLA should be notified if your aneurysm reaches 60mm in diameter. You are allowed to continue to drive if you have had satisfactory medical treatment and there is no further enlargement of your AAA. If your AAA reaches 65mm in diameter you are disqualified from driving (see reference 5 below). HGV drivers are disqualified from driving if their AAA is >55mm. All drivers can resume driving if the AAA is successfully treated (and there is no other reason for disqualification).